I am finally writing again about beads, and bead parties. That time of the year has come and I have a new partner for the amazing Bead Soup Blog Party, which reached the 8th edition and has as usual hundreds of partecipants. Without further ado let me introduce my Bulgarian Partner, Rosantia Petkova. She is a 360° crafter and likes to experiment with every kind of material and shape. And I am not talking only about beads. 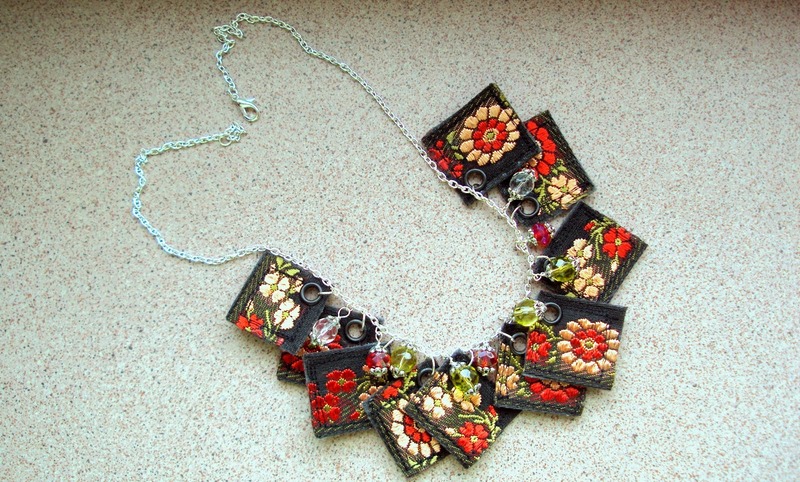 Textile necklace, how clever is that?!! It is always inspiring to have partners who like to play with new materials and love challenges, I am so curious of how things will develop! We are both still "stirring" our soups and adding the final touches, so stay tuned for more news about the soup! In the meanwhile jump to the official Bead Soup blog to see who the other partecipants are and what they're up to! Davvero belle le creazioni della tua partner! Rosantia's jewellery is so different from yours. It's very good begining! Thank you, Silvia! You have shown my most beloved creations :) And thanks to Ilenia and bailaora for the kind words! I'm an italian designer and part time beadweaver. I love crafting in all its huge possibilities. I'm a bento maniac and Japanese student. I love red hair, tattoes, rock music and pink pajamas. Ist das Kunst oder kann das weg? Guess what? I wrote a cookbook! Ethereal theme. Theme images by Goldmund. Powered by Blogger.